We have written a large article about the auto-oscillating process. It shall be published in the Proceedings of the 25th Russian conference, which took place in Adler in the last year, we have reported there this work. Very important are not only the parameters of the plasma, but also the parameters of the supplying electrodes. The common solution of the equations system which describes the current flow in the electrodes and in the plasma allows to come to the conclusion that there can exist very high frequency oscillating operating modes. and the ideology about nuclear reactions. There is no information about powder. there is only discussion about electromagnetic processes with electrons. My correspondence with Rossi about the hydrogen. As I started to analyze the presentation… he says nothing about if he uses hydrogen or not. So I wrote to him asking if he uses hydrogen. 6 minutes later he answered: Yes! So could look like the block diagram of the E-Cat SK. This is the reactor, Rossi cools it in a chamber, where argon is circulating and the argon cools the reactor. In a heat exchanger the argon has to transfer his heat to the air, which then heats the room. Possible flow chart of the heat generating element of the E-Cat SK. Flow of the currents and the possible reactor arrangement. Anode, cathode, discharge … somehow in the hydrogen medium a discharge takes place. On the right (in the picture): the typical photo of this discharge. We conclude that there occurs a very high frequency process. Mister Rossi mentions nothing about it. You can not imagine how high is this frequency of 10^12. This isn’t a stationary process, we see this looking at the oscillogram of the typical current flow. We see these constant pulsing emissions. Here is 1 milisecond between two vertical lines, along the axis, such is the sweep of the oscillograph. I.e. there is a very high frequency… Even the oscillograph can not sweep… Each bar… If there would be an oscillograph which could sweep, we would see that there occur incredible things. Such typical images we have seen on our oscillograms about what occurs in our reactor. Spectrum of the plasma radiation in the E-Cat SK, determination of the plasma temperature. I analyze the spectrums which Rossi has recorded in the optical range. He came to the conclusion that he has 8000 C and concluded about the energy. In my opinion he made a mistake of 5 and possibly of 10 times regarding the energy. A nonstandard methodology is used. And there he made a mistake most likely in the blackness and most likely in the brightness temperature, which led to a 5 and possibly to a 10 times error regarding the energy. He doesn’t measure it. Although he can measure it, but for some reason he doesn’t measure it, but calculates it. Here is the scale of the electromagnetic waves. With the oscillograph Rossi measures here in the range of 1 MHz possibly until 10 MHz. An optical spectrometer is working, here is the optical range of frequency 10^15.And there is a gamma detector in the range of 10^20. But the most important range from 10^8 until 10^12, about we talk in this auto-oscillating mode, this range isn’t covered by Rossi through any measuring devices. He possibly suspects that there is something, but he doesn’t measure anything there. And there are the most interesting processes. Electrical flow chart of the reactor in auto-oscillating mode. When you apply voltage, here is some resistance and so the energy is emmited on ?… and we gain a power. We have developed an electrical flow chart, which necessarily includes also capacitors and inductances and an additional resistance. Which shows that here a high frequency process can occur, which generates the energy. You simply don’t measure it. Condition for the start of an auto-oscillating heating in discharge. Here we derived a relation… When we achieve a certain electron density, then the frequency of the processes in the supplying electrodes and the frequency of the processes in the plasma (simply of the Langmuir oscillations) shall coincide, it shall be a resonance and then starts…. this is the condition for the start of the auto-oscillating mode. The process of the heat generation in E-Cat: auto-oscillating heating of the plasma. Our understanding is that the main heat generation process is auto-oscillating heating of the plasma due to the outer electromagnetic field. There are also interesting processes, we have spoken today about them, but Mr. Rossi doesn’t give any information about them in his presentation. Thanks to Sandy R for the following comment. “Dangerous airborne viruses are rendered harmless on-the-fly when exposed to energetic, charged fragments of air molecules, University of Michigan researchers have shown. This is a new video showing a tour of the Inductance Energy Corporation [IEC] factory floor (30,000 square feet) — also known as a ‘training center’ — in Scottsdale, Arizona, where they make and display the ‘magnet motor’ Earth Engine. Visitors are shown various versions of the Earth Engine, and are shown some videos of inventor Dennis Danzik talking about the motor and demonstrating its operation. Danzik states that they have to put a little bit of ‘inertia power’ into the motor to get it going, and then gives it a push. He also shows a simple experiment using a razor blade showing how the magnetic field used in the Earth Engine is directed. From one direction the blade is attracted to the magnet, from another, even though it is in close proximity to the magnet, there is no attraction. They state that Earth Engines will be manufactured in different states in the United States, and they seem to be looking for manufacturing partners in every state. They show some of the parts used to make up the Earth Engine, and show an Earth Engine in action. Bob sees a connection between these ideas and those of Dr. Alexander Parkhomov whose book “SPACE. EARTH. MAN.” he is preparing to translate. Bob also reviews an interview published in Infinite Energy magazine with Martin Fleischmann in which Dr. Fleischmann discusses other areas of interest such as gravitation, thermionic diodes, and the behavior of electrons in metals. He also sees connections between these ideas and the recently published patent from the U.S. Navy dealing with room temperature superconductivity, and also the work of John Hutchinson. Bob’s discussion is in this video on YouTube. Here is a post from the Facebook page of Infinity SAV in regarding their ‘magnet motor’ technology, and a recent 5-hour video demonstration they did on a small island in South Korea. Here is a description of the book. Dark matter research from the time of its discover was really only of interest to astronomers, cosmologists and exotic scientists. In recent year, however, after the accumulation of a critical mass of knowledge, it has become clear that this is not just an illusive substance, dissolved in an infinite universe, but that it is an important source of connections between space and the biosphere. We are accustomed to the fact that influencing the course of processes implies changing their speed or intensity. This in essence is the basis of all modern technology. Apparently, however, there is another type of process variability which manifests itself in the change in the order of behavior of the system’s parts. This can occur regardless of energy changes. Perhaps searching in this direction will allow us to overcome the crisis in modern natural science and open up the possibility of a new level of knowledge about in which we live. Funds raised over and above the $7000 goal will allow Bob respond to invitations to travel to Moscow and visit five private labs and two government labs of Russian LENR researchers. The following post has been submitted by Anthony Repetto, it is also published on Medium here. Back in ’89, Fleishman and Pons performed an experiment, where they seemed to fuse deuterium and generate heat — heat which might boil water, and power a turbine, generating electricity. When these heavy hydrogen fuse, they form helium, and there is no radioactive waste, no radiation emanating from the reactor. Fusion, unlike fission, is a completely clean and super-abundant energy source. The world was on fire, for a moment. Then, other labs replicated the experiment, yet they saw no heat, no fusion. Fleishman and Pons were discredited, and cold fusion died. However, those replications did not meet one critical aspect of F&P’s experiment: the adsorption of deuterium needed to exceed 80%, which happened in F&P’s setup, while the replications only loaded deuterium to 60% at best. When other researchers, years later, began loading their deuterium to 80%, they did see excess heat! Each replication of these results was declared a hoax. Yet, the evidence for some unknown nuclear reaction quietly grew. Today, though still disregarded by news media as pseudoscience, various academics, militaries, industrialists, and investors are boarding the cold fusion boat. SRI, Stanford’s lab, has verified excess heat. Toyota and Mitsubishi have successfully transmuted various elements, using the techniques developed by cold fusion researchers. And, at a special conference of the EU, the US navy presented their own work. MIT researcher Peter Hagelstein has been giving presentations on his own theoretical work for years, now. Why does cold fusion still sound impossible to the public? It’s the Coulomb Barrier. Each atom is surrounded by a halo of electron probability. When two atoms get close, those electron clouds repel each other, and the atoms bounce away. That’s the Coulomb Barrier. And, the barrier is so strong, to overcome it you must smash atoms together at incredible pressures — inside the sun, for example, or using a barrage of lasers. You couldn’t possibly push past the Coulomb Barrier at atmospheric pressure and room temperature! Unless you could weaken that electron repulsion somehow. That’s where moire come into play. Every subatomic particle is a wave function, a ripple in space-time. And, those waves overlap and interfere. So, if two wave functions are overlayed with a slight tilt or displacement, the cumulative wave function is a moire! And moire magnify their micro-scale pattern. We have a pathway to overcome Coulomb! Form a moire of the wave functions of the atomic nuclei, so that they are magnified, effectively ‘smearing them out’ over a larger area. Now that they are smeared, they can interact outside the radius of the Coulomb Barrier, and they are able to fuse. There are numerous ways to create a moire of the wave functions, leading researchers to uncover a variety of techniques for generating these Low Energy Nuclear Reactions (the modern name for cold fusion, LENR). And, when confined to a molecular lattice which is being shaken by phonons, those wave functions overlap into a moire, again (Hagelstein describes this phonon coupling quite well in his MIT classes). Same goes for a plasma that is pulsed at resonant frequencies — the wave functions ripple, overlapping in an oscillating moire which enlarges their range of interaction. Even enmeshed ‘snowflakes’ of hydrogen can ripple together and fuse! Another artifact of these moire is the appearance of toriodal corrosion of the reaction chamber. It is as if a smoke ring was caught by the metal surrounding the reaction, and examination of the boreholes shows transmutation occuring at those sites, as well. These toroids are the halo that forms around a moire pattern; as the moire ripples, its outer edges form coherent rings, areas where the wave function of the nuclei concentrate again, generating additional nuclear reactions. Understanding this process could allow the design of more durable reaction chambers, which is currently a difficult problem. 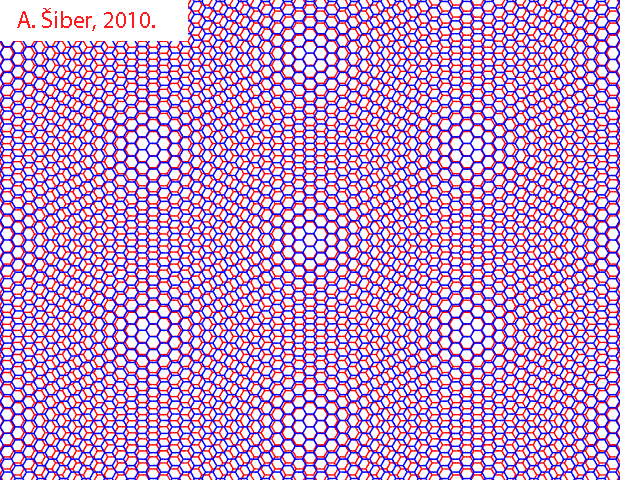 Detailed simulations of these moiré effects might allow us to control matter in new ways, and their magnification power could let us observe interactions that were previously beyond the power of our equipment. Artificial Intelligence is proving itself capable of designing parts that meet specific engineering constraints, whether those are drone bodies or car parts, and that same technique could allow us to supply AI with a moiré effect that we wish, and receive the design which best generates that moiré. Nano-scale fabrication could create billions of moiré-lasers on a chip, with ions pumped to reaction sites, for massively parallel, controlled transmutation. Carbon nanotubes’ phonon transmission and hydrogen trapping may be key to generating these beams of moiré wave functions. Such devices may be critical to LENR’s future. Not only does cold fusion produce heat, for power generation — the transmutation reaction can provide you with useful new elements. That was the thrust of Mitsubishi’s experiments, turning cheap, abundant tungsten into rare, industrially important palladium. If we have controlled LENR transmutations, we don’t need to mine asteroids for our future material needs! We can turn aluminum and silicon and oxygen here on Earth, our most abundant elements, into all the various isotopes necessary for a high-tech super society. Free energy, and free rare earth elements! Understanding the moiré of atomic wave functions can liberate us from scarcity, forever. Thanks to Greg Goble for pointing out the following new LENR patent filed by Klee Irwin published on February 28, 2019. Nanoengineered materials are disclosed for Low Energy Nuclear Reactions (LENRs). The nanoengineered materials include quasicrystals and quasicrystal approximants. The energy landscape of these materials is designed to increase a tunneling probability of atoms that participate in a fusion reaction. The nanoengineered materials are designed to have arrangements of atoms in which there are active sites in the material for LENR. The active sites may include networks of double wells designed into the material. In some examples, the design also limits the degrees of freedom for atoms in ways that increase a tunneling probability for tunneling of atoms into sites where fusion occurs. a quasicrystal or quasicrystalline approximant material designed to have an arrangement of atoms, associated with a structure of the quasicrystal or quasicrystalline approximant material, forming active sites for LENR to occur when the material is loaded with a hydrogen isotope.